← Hash Brown Potato Pie – A great Sunday breakfast! My husband LOVES the butter baked chicken dish at Cracker Barrel. He raved and raved about it until one day I had the opportunity to try it. I immediately understood his love affair. It was buttery, tender and delicious. It just melted in my mouth. The gravy was creamy and flavorful. When I mentioned to my Mom how good the dish was, she pulled out her hand-written recipe book and shared a recipe she found a few years ago. (From where, I don’t know!) The recipe calls for chicken breasts but that is not my husband favorite. He prefers dark meat so I substitute chicken thighs for him. You could even use cut up chicken pieces to satisfy everyone. To make this a true comfort food, I serve it with homemade mashed potatoes and a green vegetable. Some of our favorites are corn (OK that’s not green), carrots (nor is that one), green beans and asparagus. (Hubby likes stuffing too.) I keep a couple of cans of evaporated milk on hand just to make this recipe. Preheat oven to 350 degrees F. Pour melted butter into a 9 x 13 inch baking dish. In a shallow bowl or on some waxed paper, combine the flour, salt, pepper and garlic powder. In a separate bowl add 1/2 cup evaporated milk. Coat the chicken pieces with the milk then dredge in seasoned flour. Place chicken in prepared baking dish, skin side up. Bake, uncovered, for 35 – 40 minutes. Remove from oven and turn. In medium bowl combine the remaining evaporated milk, water and can of cream of chicken soup. Stir until well combined. Pour over chicken and return baking dish to oven for an additional 30 – 35 minutes. When done, remove chicken from pan and whisk gravy. Pour gravy over chicken and put remained in gravy boat for guests to serve themselves. 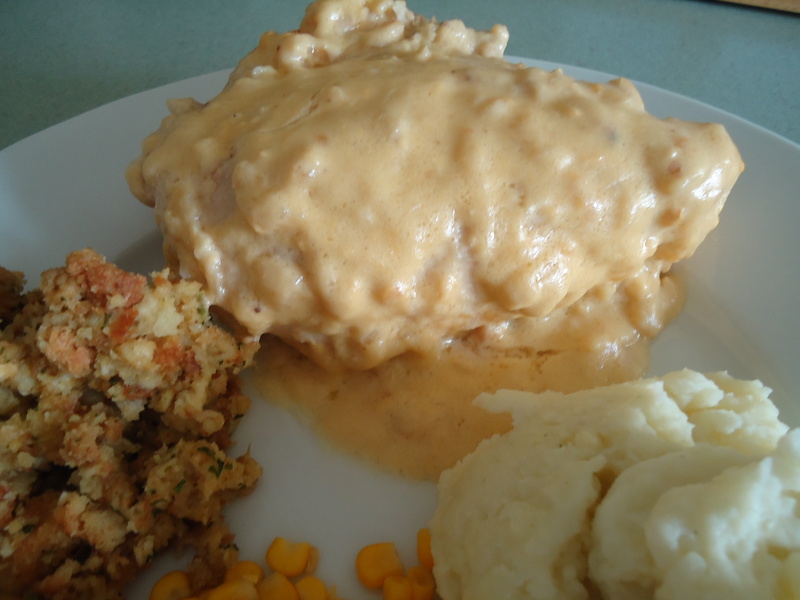 This entry was posted in Chicken, Comfort Food, Entrees and tagged baked chicken, chicken, confort food. Bookmark the permalink. I haven’t heard of butter baked chicken, but this sounds incredible – something my husband would jump through hoops for! Haven’t tried this at cracker barrel but have definitely seen it. Thanks for sharing. Enjoy your blog; keep up the great work. In the oven now, smell divine! We cant wait to dig in! Delicious! Thanks for a great recipe.